Bookmark quote Daenerys - Game of Thrones - George R.R. Martin - "I am not your little princess. I am Daenerys Stormborn..."
Très jolies bougies qui sentent super bon, une a été offerte à une amie fan d'Outlander qui a adoré ! Self-taught since my childhood, I love to read and create. Two passions that I ended up associating by creating Laura2passage, The creations of Laurapassage. First by highlighting more manual creations, with bookmarks and metal key chains, made of chains, beads, charms and ribbons. Then with the paper bookmarks, the main activity of the shop, where my graphic creativity has no limit. Laura2passage, The creations of Laurapassage is part of an approach that is both aesthetic and above all to promote the French language. Official language of 29 countries, it is today more and more neglected by many readers and creators in favor of English. 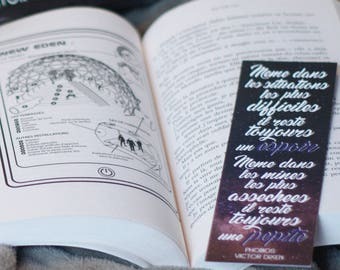 Laura2passage, The creations of Laurapassage today offers a set of quotes, mantras and pretty phrases in French with its bookmarks. Do not hesitate to send me a message for any request, I remain at your disposal and I will do my best to answer you as soon as possible. Transfer payments are unfortunately not possible on Etsy outside the Netherlands, Austria and Germany. For users who do not have a credit card, I invite you to create a PayPal account where the possession of a credit card is not necessary. Your payment will be made via your PayPal account which will deduct the amount from your bank account. The shop remains available for any bulk purchase request. Feel free to send a message or email: laura2passage.creations@gmail.com for more information. In case of surplus paid following the estimate made by Etsy, a refund of it will be made before shipment of the order. Regarding the shipping costs of candles, please refer to the fee schedule in the product description for more information.